Pittsburgh, PA (September 21, 2016) – After being displaced by a fire caused by a lightning strike in the summer of 2014, Howard Hanna real estate agents are back home in Sewickley in their brand new, state-of-the-art office at the corner of Broad and Thorn. The official address for Howard Hanna Real Estate Services is 401 Broad Street. Architect Stephen Casey worked diligently to create a building that would well suit Sewickley’s gateway intersection of Broad and Thorn Streets, while also best serving one of Howard Hanna’s top-producing offices. From 9:00am to noon, the Marty Griffin Show on KDKA 1020-AM will broadcast LIVE from the office. Marty will also be judging entries by local children in a coloring contest to benefit the Free Care Fund at Children’s Hospital of Pittsburgh. The entries have been hanging in the Howard Hanna window for the past week for all to see. At 3:00pm, there will be a blessing of the office by representatives of neighborhood faith communities. This will be followed by a ribbon cutting ceremony and a reception for the community. 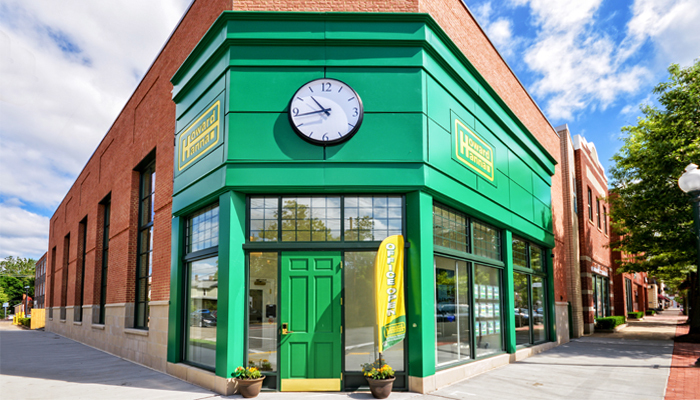 “Howard Hanna has been at home in Sewickley since 1978 when we opened our first office here on Hegner Way,” said Chairman Howard W. “Hoddy” Hanna, III. In the mid-1980s, the office moved to its current location. “It is great to be back on our corner,” added Bill Ryan, Sales Director of the office. Ryan and his agents had been doing business from two temporary locations in the village, first at the corner of Beaver and Broad Streets, and then at a location on Division Street. Designed at a 45-degree angle, the front entrance of the new office faces the gateway intersection with a nice storefront along Broad Street that features an interactive, touchscreen window. The Thorn Street side of the building has large architecturally enhanced windows similar to the library across the street. At approximately 4,300 square feet, the office provides one-stop shopping with 40+ sales associates, mortgage loan originator JoEllen Foy and insurance agent Alisa Geitgey.